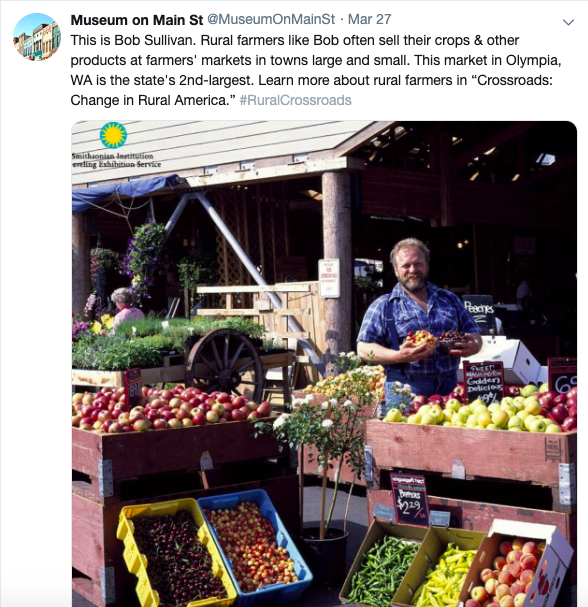 In this blog post we’re looking at two entirely different public history initiatives which both have digital, storytelling, and spatial components: Historypin and Museum on Main Street. 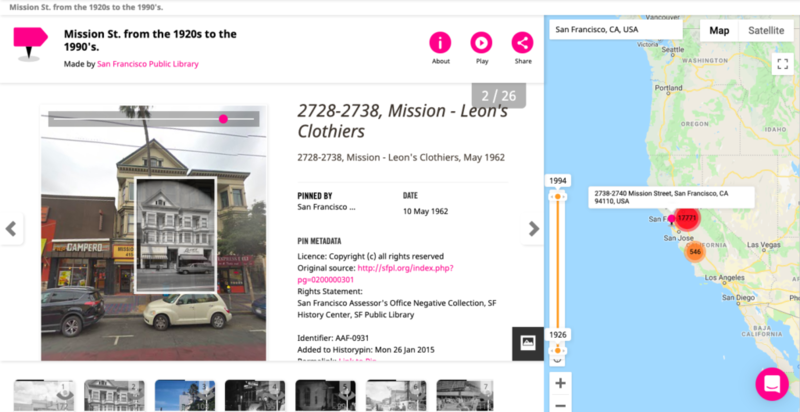 Historypin is a digital crowdsource project started in 2010. The concept is organized around the concept of a “pin” which is basically an identified location— either generally or a precise address. When you create a pin, you identify a location on a map with an uploaded image relating to that place. Pins can be organized into collections and tours. The interface seems fairly simple for creating pins, collections, and tours, but if you have any questions, their Getting Started page is great! I made this profile to make a pin before realizing I don’t really have a historic photo to upload. But you can see the menu panel to the right of ways to get started! Because SFPL made some pretty long tours, I took a look at those to see how pins can be organized by this function. On a “tour” the user virtually walks through the city and from pin to pin. Wherever a pin has been dropped, you can see the associated photo on top of a street image from google maps. The slider at the top of the screen allows you to change the opacity of the image to see the streetview behind it. I have to say I don’t love how this tour interfaces? I felt like it was kind of clunky and confusing? There wasn’t much clear hierarchy, and I couldn’t figure out how to learn more about the pin or find comments. From this screen, I thought I’d be able to see more details about and interact with the pin, but you actually have to click the link to the permanent pin to learn anymore. Once you’re visiting the pin’s actual page you can interact with the pin in the comment box. I rarely found any interaction in the comment boxes which was disappointing. Critique: To be honest, I was getting a little bored while I tried to find good pages to share with the class until I found the LGBT+ collection. After reflecting on that experience, I think Historypin is a good exercise in thinking carefully about the most effective uses for these kind of digital history projects and about who the audiences and communities are. If it’s hard to find really good examples and really good collections, then what does the ratio look like of useful and highly-interacted-with collections to unviewed collections? How do you evaluate the usefulness of the site and its contribution to the field? 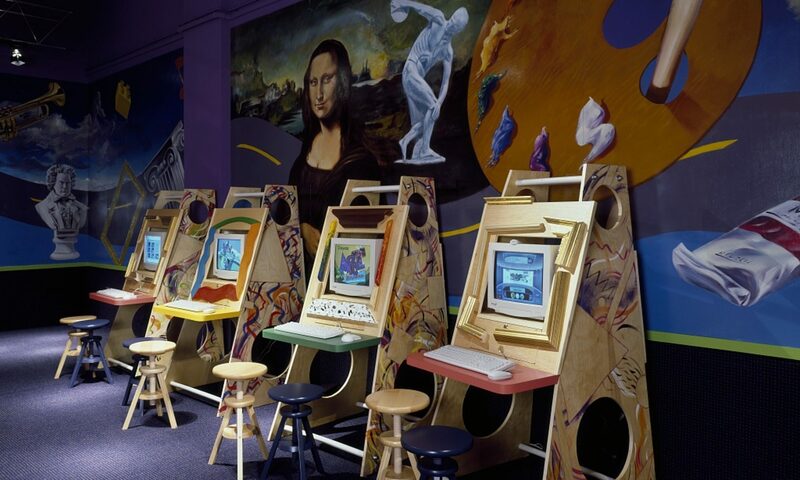 Museum on Main Street is part of the Smithsonian Institution Traveling Exhibition Services. Their mission is to “ provide access to the Smithsonian for small-town America. Museum on Main Street engages small-town audiences and brings attention to underserved rural communities.” What do they do, you wonder? These tidbits provide good stats on why MoMS sends their exhibits into small towns. I looked at the exhibition called Crossroads to learn a little more about what these exhibitions are really like. This page teaches you more about the exhibition, themes, the tour schedule, and further resources. The Exhibitor Resources page shows a bit of the backend of how MoMS is trying to create a network of resources for their exhibitions and for their partners. The concept for the exhibitions from Museum on Main Street is a fairly top-down way to do this kind of local and community oriented history which presents an interesting model and an interesting dilemma about how to do this kind of history. The participatory storytelling component is considerably more community-based and still spatially oriented, but a little less so. I thought they might have really great social media that navigates some of my questions about how they work with and elevate the local communities they’re working with, but I was disappointed. While I love this picture, I think that MoMS’s social media could really do some interesting work talking about the communities the exhibits are currently visiting and the programming around them. This could maybe provide a national platform for that discussion and their local partners. Instead they’re just showing off Bob and advertising for the exhibit which they don’t even mention the current location of (Florida). A great story tells us about YOUR American experience. It could be a special memory from your childhood, an oral history from your grandparents, an anecdote about family life, or a story about a local gathering spot in your community. Help us uncover and celebrate what makes YOUR community unique by sharing your story today! The site includes a fully searchable database, so I would assume you could use these stories for local and community-oriented research. I think this aspect of the MoMS project is rooted in some key topics for this class: storytelling, participatory projects, and it is both spatially- and community- based while providing access to “the museum” (in the broad/ vague/ institutional sense of the word). Anyway, while that is a bit off topic, at the root of that argument is that “place” matters! For both Historypin and Museum on Main Street, as digital history folks, we can think about how these projects fit into the field and how they are maybe not the best solutions, tools, and programs but lead us to ask questions about what a better solution, tool, or program would look like. What do you think about these projects? Particularly those of you map-lovers making maps for your digital projects— do you think Historypin looks useful for you? Ann E. McCleary, “Creating Teaching Opportunities and Building Capacity Through the Museum on Main Street Program,” The Public Historian 36, no. 4 (November 1, 2014): 71, https://doi.org/10.1525/tph.2014.36.4.71. Luckily, while he suggests that collaboration is the most difficult task when doing design, or for our purposes working on any digital project, Brown has answers. Rather than providing suggestions for how to engage in interpersonal relationships, Brown describes how to create documentation—a historian’s dream— to keep a record of the project and to help team members communicate more effectively. The entire team being on the same page—the creators, users, and approvers from the design team to the clients and stakeholders— contribute to the success of the project. That Brown can manage to make these deliverables sound simple to me—a person with no real design experience, particularly any web-based design experience— is a testament to his successful explanation of these principles. The structure of each chapter is identical which is an intentional effort to give the same advice for each deliverable, making the book easy to follow. Each chapter starts with an introduction including a definition. He follows this section with an overview, challenges, the process of creation, presenting the deliverable, and putting it in context. The organization is formulaic and effective. A particular strength of the book, is Brown’s close attention to personas, referring to the system’s intended users. Brown encourages projects to treat these personas as actual people, featuring profiles and detailed scenarios. This chapter emphasizes, from a design-standpoint, the importance of recognizing audience and who will be interacting with our products. While this might seem obvious to those of us with a public focus to our work, it’s evident that most traditional scholarly work isn’t created with a close eye on “users.” Those which do have a wide-public appeal are lauded as rare beasts. As Public Historians, we do much more of this kind of work, and Brown contributes a useful model for a practice many of us have seen when learning about working with the public on the museum floor or as an interpreter. Taking this experience to the web and making it digital complicates our understanding of the user, and that’s why User-Centered Design is so important—which we hear more about this week from Sara’s blog post. As a Public Historian, or any historian interested in doing collaborative work—which digital history often is— Communicating Design reminded me of every major scholarly project I’ve contributed to, particularly of the process of keeping records and sorting documents. In the preface, he emphasizes how the field of web design is particularly guilty of lacking good documentation, and honestly, most projects are. His point is well-taken because it proves difficult to track group decisions and to recognize how those decisions impact the eventual product or outcome without a dedicated effort to this end. These documentation efforts are like the footnotes of a traditional scholarly work. We need to leave a trace of how we came to create a project or future projects will be unable to build on our experiences. By tracking these efforts and creating clear deliverables along the way, a project is better able to defend choices, methodology, and the theory informing their product, and future projects and scholarship will benefit from this endeavor. This book is straightforward, as a how-to guide should be. The creativity, as we know, is the product of actively doing the work and wading into an actual tool like Omeka, which we see several of our classmates attempting here and here or from Emily’s blog post, checking out digital projects seeking grants. It’s only when we start creating that things start getting messy, but with the structure and methods laid out by Dan Brown’s Communicating Design, maybe our own projects will look a little more straightforward.